James Madison University smited Virginia Tech in Football. 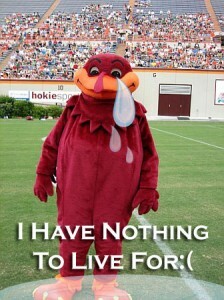 Now all the Hokie bird can do is cry. This was quite the blow to Virginia Tech whose students have nothing more going for them than football and cow pastures. After realizing that their football team, rituals, and stadium was just a big great lie, they cried and wept for hours. Here is a great photo capturing their mascot a “Hokie Bird” (a castrated turkey) crying after the loss to James Madison University. Copperplate Gothic Bold is the perfect font to accompany such a momentous event. James Madison University rose up and showed that they have a history of winning, of being National Champions, and that no amount of noise, glitter, or tom foolery can change that. So Hokie bird, it’s going to be a rough season, there will be many more tears and upsets. It’s not a horrible thing to get used to though, you’ll see, there are other things than football. At least the grass on the field will stay a bright green from all the tears you will be crying. Thanks to this site for the original photo. Now Hiring Incredible People with the Power of CGB!